It's finally April! Since I have a bad case of Spring Fever this year, I have been looking forward to watching the flowers and trees finally burst open and to getting my hands dirty in the garden. But warm weather is not the only reason I am excited. April is also Confederate History Month, and I am really honored to help spread the word about this important component in our nation's history. I urge everyone to visit the Georgia Division Sons of Confederate Veterans' Confederate Heritage website for updates on events and proclamations, and to take some time to learn about those who helped shape this country. 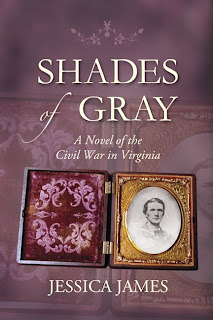 One of the goals I had when writing my historical fiction novel, Shades of Gray, was to compel readers who really had no interest in the War Between the States (or those who had been taught a politically correct view) to want to learn more. That will be my goal this month as well over at my Jessica James blog. I will be posting throughout April on topics that focus on Confederate history, and hope you will stop by and take a look. As I noted above, I will be giving away two signed copies of Shades of Gray and look forward to reading everyone's comments!